The Arduino is connected to the PC via a USB port. 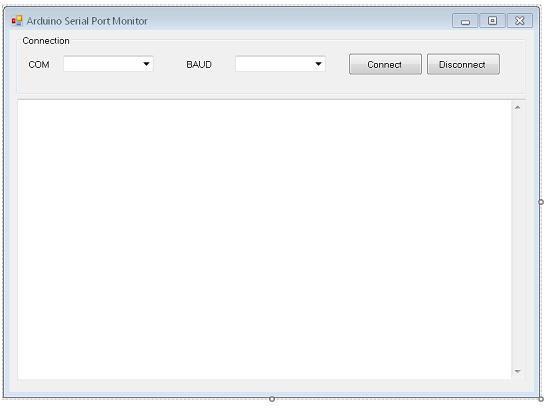 Visual Basic can be programmed to receive or send data across that port. There already is a Serial Port Monitor in the Arduino programming IDE and it does the job you need for the most part. The purpose of this page is to replicate at least the same functionality using a Visual Basic program. If data can be sent or received to the Arduino using another programming, that opens up some interesting possibilities. This page is all about the principles. Arduino connected to USB port. There is no need to start with any components connected up - all we need to do is see if we can connect to the Arduino port and read data from it. To start off, we'll just write a program that sends some data to the Serial port regularly. At the top of the form, you have a GroupBox. Inside the GroupBox, there are 2 ComboBoxes, each with its own Label. The ComboBoxes are called cmbPort and cmbBaud. There are 2 Buttons, one called btnConnect and the other called btnDisconnect. Below the GroupBox, there is a large TextBox. It has been named txtIn and has its Multiline property set to true and its Scrollbars property set to Vertical. The next set of statements define a few procedures we need to use. First you have a subroutine to list the serial ports that are available. Depending on the peripherals you have attached to the PC, this could be a few. There is also a procedure to add text to the end of the text box. Double click on an empty part of the form and the code window should pop up with headers for the Form_Load event. The following code will populate the ComboBoxes. This last block of code prevents the user from closing the form without first disconnecting. Our last main job is to create an event handler to process information arriving at the serial port. We need to amend our Arduino sketch a little so that it can receive data from our program. Back in Visual Basic, we need some controls to be able to send data to the Arduino. Here you can see a Textbox which I have called txtMessage and a button called btnSend. Double click on the button to bring up the code for its event handler. If the port is open, then the contents of the TextBox are written to it. You can test the program at this stage. Whatever you type in and send will be printed back to the serial port, one character at a time (with a delay of one second between each character). This page demonstrates a principle. So far it does not make anything that you haven't already got within the Arduino IDE, but it does show that you can send and receive data to and from the Arduino using Visual Basic. One simple extension to this program would be some additional functionality. For example, you could make it possible to clear the TextBox of incoming messages. This is useful if you have a lot of data streaming from the Arduino and all you want to do is see what is happening at any point in time. You could add a time index next to each line that you receive from the Arduino. That would be useful for measuring the delays that this chain of communication can create. You will notice that the odd millisecond is lost here or there. It would also be useful if you were to use the Arduino for data logging over time. One really useful bit of functionality would be the ability to save the data in the TextBox to a file. A flexible approach to this would be most useful for the user. For example, imagine that when they choose to save the contents of the TextBox, another window popped up showing those contents, allowing them to make small edits to remove any unwanted items (you often get strange or partial readings at the points where you connect or disconnect) before saving the file with the extension of their choice.